Since 1978, the Tour of the Unknown Coast has been touted as one of California’s toughest century rides, and among the most beautiful rides anywhere. Some would say that rough roads are part of the adventure on this ride, but we are still pleased to announce that road conditions on the course have improved in several locations, including the historically rough section on Bull Creek Flats Road as well as on the climb to Panther Gap and descent to Honeydew. 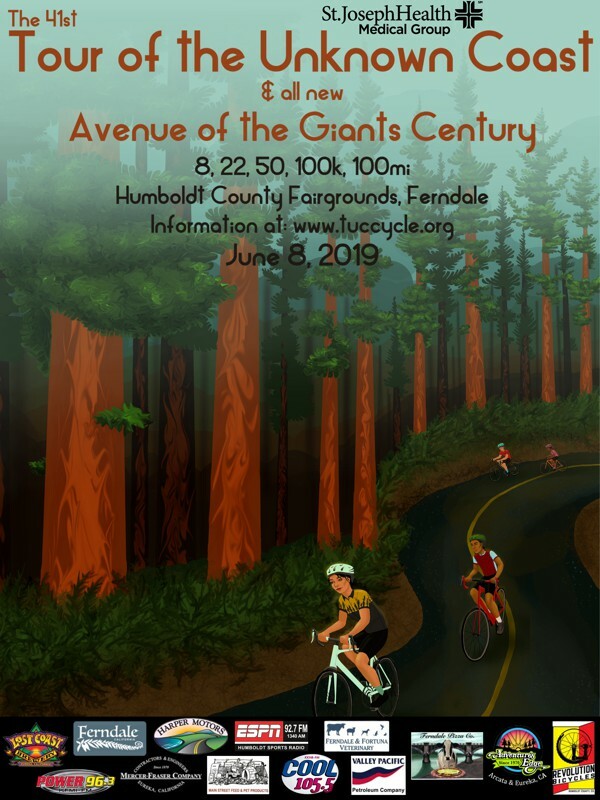 For 2019 we’re stepping up our game and adding the new Avenue of the Giants Century. 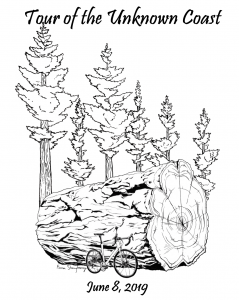 This beautiful route through the redwoods features smooth pavement and significantly less climbing than the traditional century ride. If 100 miles in a day isn’t your idea of fun, we’re still offering our 100K, 50 mile, 22 mile and 8 mile rides to suit every taste. Stick around after the ride for our post-ride festivities, including music by local band “Ghost Train”. And remember to purchase an event t-shirt as a souvenir of the day! T-shirts will be available at the start/finish for $15. We’re still working on the final product, but expect this image to be printed on a solid color t-shirt. It will be available in both sport fabric and cotton blend fabric.